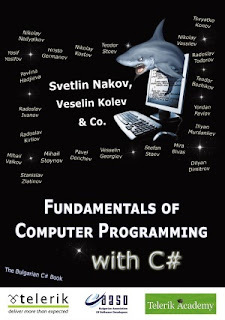 The free book "Fundamentals of Computer Programming with C#" (http://www.introprogramming.info) is a comprehensive computer programming tutorial that teaches programming, logical thinking, data structures and algorithms, problem solving and high quality code with lots of examples in C#. It comes with free video lessons, presentations, exercises and solutions. This free book on fundamentals of programming teaches the major programming concepts and way of thinking needed to become a good software engineer and the C# language in the meantime. It is a great start for anyone who wants to become a skillful software engineer. The books does not teach technologies like databases, mobile and web development, but shows the true way to master the basics of programming regardless of the languages, technologies and tools. It is good for beginners and intermediate developers who want to put a solid base for a successful career in the software engineering industry. The book is accompanied by 27 free video lessons on C# programming (42 hours), presentation slides (27 PPTX presentations) and mind maps, as well as hundreds of exercises with solutions and live examples.